[Android 7.1 Nougat OS] T96N runs on Android 7.1 System which is perfect in productivity, stability and performance, along with various of features and optimizations, delivering an improved user experience. [RK3328 Quad-Core CPU] Powered by high-performance RK3328 Quad-Core CPU up to 1.5GHz, T96N will be able to play 4K videos with H.265 codecs. It also features HD 2.0, USB3.0 and a Mali-450MP2 GPU. [2GB ROM & 16GB ROM] It boasts 2GB RAM and 16GB ROM, supporting extension storage up to 32GB, giving you more space to download your favorite media files or apps and to browse websites, play games, watch movies more smoothly. [Your Own Home Theater] Once connected T96N with your WiFi or RJ45, your HDTV becomes into a smart streaming machine. 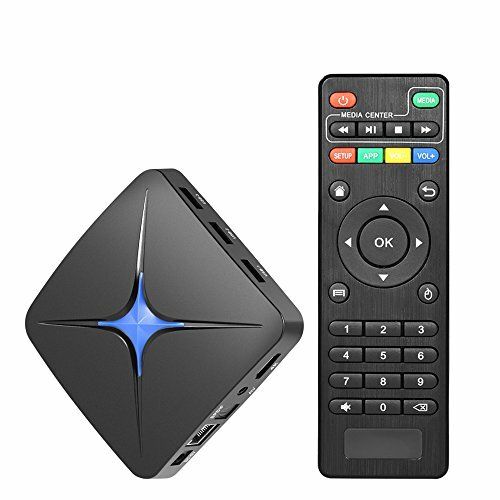 You will watch movies and TV shows and play games from the Internet, making home entertainment easier.